Quickly advance talent from interview to hire and provide consistent candidate feedback with evaluation management. Leverage automated reminders and mobile-friendly feedback forms to remove obstacles, increase productivity, and get offers out faster. Remove obstacles for recruiters and staff with streamlined evaluations and follow-up in one place — making it easy to provide feedback and make better hiring decisions. Speed up the hiring process with bulk assignments and automated reminders that ensure candidate evaluations — and hiring decisions — are completed promptly. Free On-Demand Webinar: You’ve implemented a strong sourcing program, a creative recruitment marketing strategy and an engaging onboarding program. But did you know none of these initiatives matter if your candidate interview experience is less than stellar? 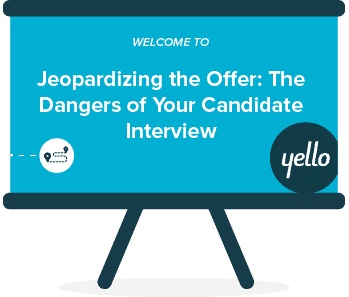 Watch our session with experts from Brandon Hall and Yello to learn how you can transform your interview experience from risky to rewarding. With complete visibility into program-wide evaluations, identify slow points in the hiring process or high-level candidate data trends to make improvements for the future. "When you're at career fairs and meeting 50 - 60 candidates, it's hard to remember what each of those interactions was like. Having evaluation forms easily available with their resume let's me tie in what my experience was like with that candidate and be able to place them for a specific position." See how candidate evaluation software simplifies interview candidate feedback for your team.